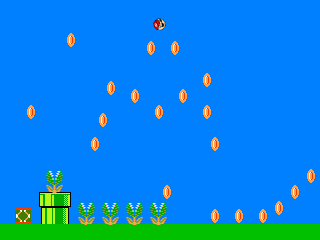 Super Rolling Mario is the first game completed and released by Friendly Dictator. It was finished in 2009 and never saw a release on neither the forums or main site, but rather the YoYoGames Sandbox. On December 10, 2016, the game finally saw a release on the forums. It was submitted to the mainsite the same day, but it was declined by site staff. Friendly Dictator had done a stream in 2016 showcasing his older games, and this was one of them. The particularly bad graphics, physics, and sound design make it a bit of a joke within his circle of friends. Super Rolling Mario has very shallow gameplay. You can roll Mario left or right using the arrow keys or the left and right mouse buttons. You can use space or the middle mouse button to jump, which is an important fact to know for one of the levels which requires you to grab a star. Since Friendly Dictator didn't know how to use variables during the game's creation, invincible Mario is a separate object - which doesn't have the keyboard controls, forcing you to make a jump using the middle mouse button. A particularly exploitable glitch involves repeatedly pressing on a direction while in the air to slow Mario's descent. One level requires the use of this "technique". This page was last edited on 13 December 2017, at 02:36.